With his exhibition Ghosts, opening at Counterpath on Friday, November 2, 2018, 6-9pm, and on view through November 30, Berlin-based, American artist Erik Smith focuses on the material traces of history and memory specific to the Counterpath site and surrounds of Denver’s East Colfax neighborhood, reconfiguring and collaging these to generate “new ambiances and new psychic possibilities” (Debord) for reconsidering the legacies of the area and its present-day meanings. A temporary excavation of Counterpath’s outdoor lot exposing the former location of a buried oil tank, a long-defunct 1950s street lamp located in front of the building made to flicker at night, and a series of found/discarded furniture collected around the city, painted black, and embedded with speakers emitting the droning and crackling sounds of a flickering fluorescent light form the central sculptural and sonic components of the exhibition. In combination they establish a dichotomy between present and past, positive and void, inside and outside, gallery space and the lot surrounding the Counterpath building, a former auto repair shop built in 1954 and revamped as an exhibition and cultural venue in 2015. 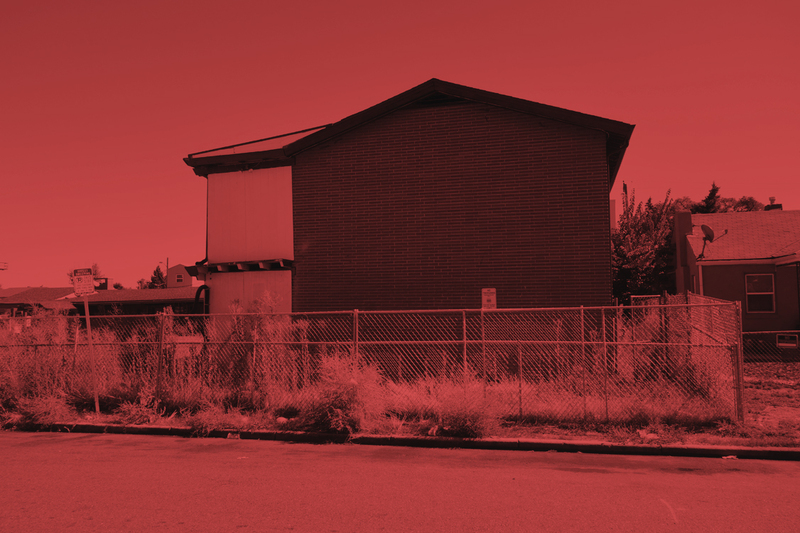 The title, Ghosts, points not only to the partial reanimating of the site’s past identity but also to the many vacant and derelict commercial buildings of this portion of East Colfax Avenue, an area long associated with transience, drug addiction, and prostitution. 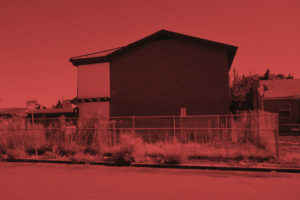 Smith documented these structures and other abandoned homes while canvassing the area for materials and images, his form of “walking research,” creating a visual archive that reflects psychoanalyst and author Christopher Bollas’s assertion, in his essay on architecture and the unconscious, that “each city has its ghost towns.” These images are presented in the form of a video slideshow and paired with a dark ambient audio track created by Smith in his Berlin studio, adding a further layer of estrangement to a portrayal of the city at odds with the popular vision of economic boom times. Themes of urban disaffection also resonate in another large-scale work installed inside the gallery: a series of black 3×5’ vinyl flags, sewn partially together to form a semi-contiguous whole, are presented as an abstract, non-functional domestic element spanning the main wall of the space. The black flags, a symbol rooted in anarchist movements of the nineteenth century, along with the void of the dig and the droning and crackling of the flickering light, allude not only to the precarious reality of neighborhoods, buildings, and domestic objects at the end of their use cycle but also the current political and social unease hanging over society at large. Ghosts are dead buildings as well as the death of ideals around community and a sense of shared destiny today. With special sound performances by Din Virulent and Michael Lowe. A conversation with local residents be facilitated near the end of the evening on November 2 and all are invited to participate.